Context: Neuraxial analgesia and walking epidural is the popular method of practicing labor analgesia. The combination of local anesthetic and opioid is advantageous as it prolongs the duration of labor analgesia. Ropivacaine is the newer local anesthetic agent having lesser motor effects and toxic effects hence would be preferred for labor analgesia. Aims: The primary objective of the study was to assess the duration of analgesia of the intrathecal drug. The secondary objective was the assessment of onset, fixation of analgesia, motor weakness, ambulation, sedation, incidence of side-effects, maternal, and neonatal outcomes. Settings and Design: This is prospective, randomized, controlled, double-blinded, study of 120 patients consenting for labor analgesia. Subjects and Methods: A total of 120 primiparas with a singleton pregnancy in active labor who were given combined spinal epidural (CSE) were included in the study. These patients were randomly allocated to three groups of 40 each and received CSE. Group F-received 25 μcg fentanyl intrathecally. Group BF-received 25 μcg fentanyl with 2.5 mg isobaric bupivacaine intrathecally. Group RF-received 25 μcg fentanyl with 2.5 mg isobaric ropivacaine intrathecally. Statistical Analysis Used: Correlations among different measurements were assessed using Pearson's correlation coefficients, P <0.05 was considered to be statistically significant. Results: The three groups show comparable demographic data and obstetric parameters. The duration of spinal analgesia was significantly greater with Group RF 106.63 ± 17.99 min and Group BF 111.75 ± 23.58 min than the control Group F which was 60 ± 10.39 min with P = 0.001, but were comparable for Group BF and RF. The secondary outcome was comparable in all the three groups. Conclusions: The addition of bupivacaine or ropivacaine to fentanyl intrathecally increased duration and quality of analgesia, did not affect ambulation and bearing down. The incidence of side-effects, maternal and neonatal outcomes and maternal satisfaction were comparable in all groups. Hence, the effect of both the local anesthetics with fentanyl intrathecally has similar effects, and there was no added advantage of ropivacaine over bupivacaine. The primary outcome of the study was the duration of analgesia of the intrathecal drug. The secondary outcome was the assessment of onset and fixation of analgesia, motor weakness, effect on ambulation, sedation, incidence of pruritus, nausea, vomiting, urinary retention and labor and neonatal outcome. We monitored all patients for hemodynamics parameters such as pulse rate, systolic blood pressure (SBP), diastolic blood pressure (DBP) and mean arterial blood pressure (MAP), oxygen saturation, level of spinal analgesia, assessment of somatosensory functions, and motor blockade. This is prospective, randomized, controlled, double-blinded, single centered study conducted in our hospital after ethics committee approval of 120 patients consenting for labor analgesia. These patients were randomly allocated to three groups of 40 each. Group F is the control group which received 25 μcg fentanyl intrathecally. Group BF is the study group which received 25 μcg fentanyl with 2.5 mg isobaric bupivacaine intrathecally. Group RF is the study group which received 25 μcg fentanyl with 2.5 mg isobaric ropivacaine intrathecally. Patients were allocated to their respective groups by block randomization with a block of 15. Chits were labeled as F1-F5, RF1-RF5, and BF1-BF5. The labor room nurse was asked to pick up the chit, and the patients were allotted to the respective group. Initially, a pilot study of 10 cases in each group was done and the sample size was calculated considering the difference in the duration of analgesia between groups. With the assumptions of alpha as 0.05, standard deviation (SD) as 17.67 min and maximum difference between the means of three groups as 49 min, a sample size of 25 was adequate. Hence, we decided to select a study group of 40 per group. Patients included in the study were 38-40 weeks primiparas of American Society of Anesthesiologists status I and II, consenting to be included in the study, with a singleton pregnancy, induced labor, now in active labor with a cervical dilatation between 3 and 6 cm and expected to have a normal course of labor. Patients refusing labor analgesia, having twin pregnancy or with malpresentation other than vertex, mode of delivery converted to cesarean section within 30 min of administration of labor analgesia, having inadequate analgesia visual analog score (VAS) of more than 5, 30 min after intrathecal study solution, were excluded from the study. After the patient consented for labor analgesia, a peripheral venous access was secured. All patients received combined spinal epidural (CSE) in the sitting position at L2-L3 or L3-L4 spinal level with 18G Tuhoys needle and 27G spinal needle, with the loss of resistance and needle through needle technique. After confirming the free and clear flow of cerebrospinal fluid (CSF) the study drug was injected. 20G epidural catheter was inserted for 5-6 cm in the epidural space and taped securely to the back. The placement of the epidural catheter was confirmed with negative aspiration for blood and CSF. All patients were preloaded with at least 500 ml Ringer Lactate. After giving CSE, the patients were monitored by the anesthesiologist and obstetrician who were not involved in the study. Both patient and monitoring anesthesiologist were blinded to the study solution. Patients once relieved of the pain were asked to put there foot on the ground, so as to feel the ground. They were then advised to lie down in the supine or left lateral position as per the patient's choice. They were supplemented with oxygen at 2 L/min with a nasal cannula. Patients were monitored for pulse rate, SBP and DBP, MAP, oxygen saturation and continuous fetal heart rate monitoring. These parameters were noted every 5 min for the first 15 min and thereafter every half an hour. Any incidence of hypotension was SBP <90 mm of Hg, was treated with a bolus of 100 ml of Ringer's lactate and if required with injection ephedrine in titrated doses. The time required for reduction of pain in the subsequent contraction was assessed and was noted as the time required for the onset of analgesia. Pain was measured by VAS on the scale of 1-10 where 1 was minimal pain, and 10 was the worst pain. The time required for the patient to be pain free or VAS of 0-1/10 was noted as the time required for fixation of spinal analgesia. If the patient did not have adequate pain relief within 30 min of the study solution patient was excluded out of the study. The level of spinal analgesia was assessed by pin prick technique. The patients were assessed for the occurrence of paresthesia, ability to feel the ground and motor blockade. The assessment of motor function was done with modified Bromage scale where motor block was graded by 0 = able to straight leg raise against resistance, i.e., no detectable motor block, 1 = unable to straight leg raise, but able to flex knee, 2 = unable to flex knees but able to flex ankle, 3 = unable to move hip. Any incidence of pruritus, nausea, vomiting, drowsiness, inability to bear down, and inability to feel the ground post study solution were noted. The duration of spinal analgesia was assessed, noted by the time at which patient complains of pain VAS >5/10, with increasing intensity, from the time of injection of the study solution. Epidural boluses of 0.1% of bupivacaine or ropivacaine with fentanyl 2 μcg/ml were given respectively for Group BF or RF and either of them to Group F for subsequent pain relief. The total duration of labor was noted. The incidence of fetal bradycardia, its reversibility and fetal outcome was noted. The outcome of labor, mode of delivery, assistance to vaginal delivery was noted. Data were managed in Microsoft Excel spreadsheet. Demographics are described with mean, median, range, and SD. Demographics, obstetric parameters and general information such as count, average, and percentage for various parameters were calculated in Microsoft Excel. Correlations among different measurements were assessed using Pearson's correlation coefficients. A P < 0.05 was considered statistically significant. One-way ANOVA is used to investigate and model the impact of various parameters such as the onset of analgesia, duration of analgesia, duration of labor, pulse, SBP, DBP, MAP, local anaesthetic (LA) requirement for episiotomy, outcomes and complications, etc., between the three groups. Paired t-test is used to compare hemodynamics within each group. All specific graphs drawn and statistical analysis was performed using Minitab 16. Among the 120 patients included in the study, none of them were excluded out of study for any reason. 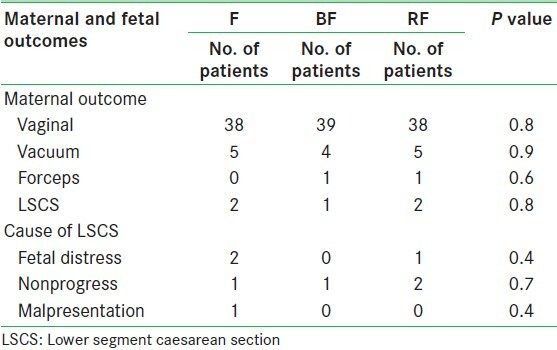 The demographic details and obstetric parameters are shown in [Table 1]. Station was graded as −3 = 0, −2 = 1, −1 = 2, 0 = 3, +1 = 4 and +2 = 5. The average station of the presenting part is between −2 and −1 in all the three groups and is comparable. The three groups show similar demographic data and obstetric parameters. One-way ANOVA was used to compare the above parameters. 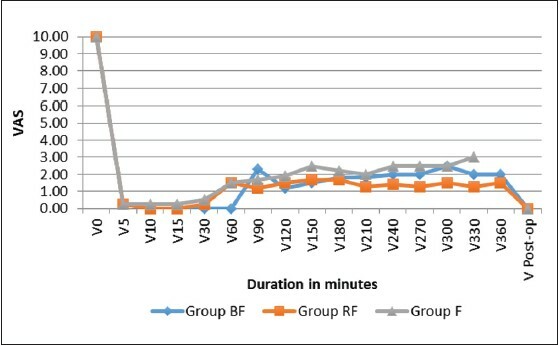 [Figure 1] shows the VAS scores in all the groups. 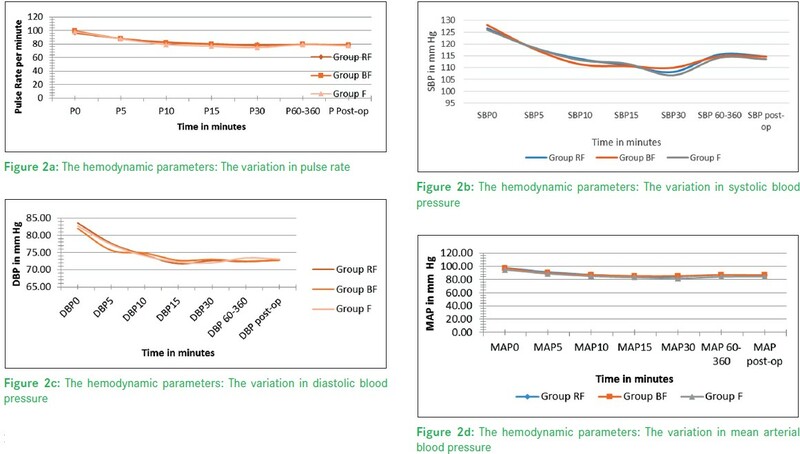 [Figure 2] shows the haemodynamic parameters in all the groups. Paired t-test is used to compare hemodynamics within each group. The effects of the study solution is shown in [Table 2]. One-way ANOVA is used to investigate and model the impact of various parameters such as the onset of Analgesia, Duration of analgesia, duration of labor, LA requirement maternal and neonatal outcome [Table 3] side-effects [Table 4] etc., between the three groups. "Walking epidural" is preferred for labor analgesia as it aids the progress and outcome of labor. The patients should be pain free to be ambulatory. Ropivacaine causes lesser degree of motor blockade as compared with bupivacaine  as its relative potency for motor blockade in comparison to bupivacaine is 0.59 and thus would be advantageous in ambulatory labor analgesia. As ropivacaine is available in isobaric form in our country, we decided to evaluate the effect of intrathecal isobaric ropivacaine-fentanyl and isobaric bupivacaine-fentanyl with intrathecal fentanyl for its onset and duration of analgesia, its motor effects, the effects on ambulation, and labor outcome. We included 120 cases in our study that were allocated to the respective groups. None of the patients were excluded out of study for any reason. The demographic data and the obstetric parameters as mentioned in [Table 1]. Such as parity, cervical dilatation, effacement, and station of the presenting part in all the three groups were comparable. The average level of spinal analgesia was between T9 and T10 level in all the groups as in [Table 2]. 11 and 12 patients respectively did complaint of transient tingling numbness in the feet and inability to feel the ground immediately after giving spinal analgesia in Group BF and Group RF. Thus, the somatosensory functions of dorsal columns were affected which are essential for ambulation and balance of the patient. This effect reverted within 30 min. We made our patients ambulate only after the return of somatosensory functions and only when they were comfortable and confident to ambulate independently. The VAS scores for analgesia as shown in [Figure 1] were comparable in all the groups. None of our patients had difficulty in bearing down and all were ambulatory during labor. In the peripartum period, no patient had an incidence of post dural puncture headache. We concluded from our study that addition of bupivacaine or ropivacaine to fentanyl intrathecally increased duration and quality of analgesia with similar safety profile. Addition of local analgesic did not hamper ambulation and bearing down of the patient and had similar incidence of pruritus, maternal and neonatal outcomes, with a good patient satisfaction. Hence, the effect of both the local anesthetics with fentanyl intrathecally has similar effects, and there was no added advantage of ropivacaine over bupivacaine. 1. Wilson MJ, Cooper G, MacArthur C, Shennan A, Comparative Obstetric Mobile Epidural Trial (COMET) Study Group UK. Randomized controlled trial comparing traditional with two "mobile" epidural techniques: Anesthetic and analgesic efficacy. Anesthesiology 2002;97:1567-75. 2. Vallejo MC. Regional analgesia/anaesthesia techniques in obstetrics. Schneider and Levinson's Anesthesia for Obstetrics. 5 th ed. Ch. 9. Sect. 3. Philadelphia, PA. Wolter Kluwer, Lippincott Williams and Wilkins; 2013. p. 119-43. 3. Singh H, Yang J, Thornton K, Giesecke AH. Intrathecal fentanyl prolongs sensory bupivacaine spinal block. Can J Anaesth 1995;42:987-91. 4. Kuthiala G, Chaudhary G. Ropivacaine: A review of its pharmacology and clinical use. Indian J Anaesth 2011;55:104-10. 5. Wille M. Intrathecal use of ropivacaine: A review. Acta Anaesthesiol Belg 2004;55:251-9. 6. Miro M, Guasch E, Gilsanz F. Comparison of epidural analgesia with combined spinal-epidural analgesia for labor: A retrospective study of 6497 cases. Int J Obstet Anesth 2008;17:15-9. 7. Pfenninger JL, Fowler GC. Intrathecal analgesia in labor. Pfenninger and Fowler's Procedures for Primary Care. 3 rd ed. Ch. 170. Mosby, Elsevier Inc; 2011. p. 1151-4. 8. Campbell DC, Camann WR, Datta S. The addition of bupivacaine to intrathecal sufentanil for labor analgesia. Anesth Analg 1995;81:305-9. 9. Douglas MJ. Walking epidural analgesia in labour. Can J Anaesth 1998;45:607-11. 10. Camorcia M, Capogna G, Berritta C, Columb MO. The relative potencies for motor block after intrathecal ropivacaine, levobupivacaine, and bupivacaine. Anesth Analg 2007;104:904-7. 11. Russell IF, Holmqvist EL. Subarachnoid analgesia for caesarean section. A double-blind comparison of plain and hyperbaric 0.5% bupivacaine. Br J Anaesth 1987;59:347-53. 12. Loubert C, Hallworth S, Fernando R, Columb M, Patel N, Sarang K, et al. Does the baricity of bupivacaine influence intrathecal spread in the prolonged sitting position before elective cesarean delivery? A prospective randomized controlled study. Anesth Analg 2011;113:811-7. 13. Hallworth SP, Fernando R, Columb MO, Stocks GM. The effect of posture and baricity on the spread of intrathecal bupivacaine for elective cesarean delivery. Anesth Analg 2005;100:1159-65. 14. Martin R, Frigon C, Chrétien A, Tétrault JP. Onset of spinal block is more rapid with isobaric than hyperbaric bupivacaine. Can J Anaesth 2000;47:43-6. 15. Hughes D, Hill D, Fee JP. Intrathecal ropivacaine or bupivacaine with fentanyl for labour. Br J Anaesth 2001;87:733-7. 16. Levin A, Datta S, Camann WR. Intrathecal ropivacaine for labor analgesia: A comparison with bupivacaine. Anesth Analg 1998;87:624-7. 17. Polley LS, Columb MO, Naughton NN, Wagner DS, van de Ven CJ. Relative analgesic potencies of ropivacaine and bupivacaine for epidural analgesia in labor: Implications for therapeutic indexes. Anesthesiology 1999;90:944-50. 18. Beilin Y, Halpern S. Focused review: Ropivacaine versus bupivacaine for epidural labor analgesia. Anesth Analg 2010;111:482-7. 19. Parry MG, Fernando R, Bawa GP, Poulton BB. Dorsal column function after epidural and spinal blockade: Implications for the safety of walking following low-dose regional analgesia for labour. Anaesthesia 1998;53:382-7. 20. Shah MK, Sia AT, Chong JL. The effect of the addition of ropivacaine or bupivacaine upon pruritus induced by intrathecal fentanyl in labour. Anaesthesia 2000;55:1008-13. 21. Canan U, Ornek D, Kilci O, Donmez F, Gamli M, Dikmen B. Comparison of the maternal and neonatal effects of bupivacaine plus fentanyl and ropivacaine plus fentanyl during cesarean delivery. Niger J Clin Pract 2013;16:195-200.